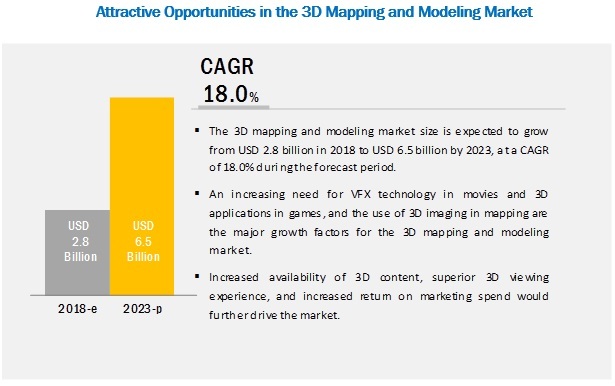 [136 Pages Report] The global 3D mapping and modeling market size is expected to grow from USD 2.8 billion in 2018 to USD 6.5 billion by 2023, at a Compound Annual Growth Rate (CAGR) of 18.0% during 2018–2023. Increasing need for VFX technology in movies, 3D applications in games, and use of 3D imaging in mapping are major growth factors for the 3D mapping and modeling market. The demand for 3D modeling technology is augmented in the film industry, as it makes a noticeable impression on the industry by providing the finest animation practices. 3D full-length movies have increased the need for 3D modeling, which helps artists and animators develop detailed models of objects, including characters, landscapes, buildings, and more, to be used in animated films. There are many 3D modeling products and solutions available in the market that help create realistic 3D models and special effects for animation and movies. The 3D mapping and modeling technology helps computer-generated buildings to be created along with landscapes. CAD and 3D modeling techniques are time-saving and help get a succinct view of the project, landscape, or construction site. The final output to be constructed can be seen in terms of its length, breadth, and height using the 3D technology, and with realistic 3D virtualization, simulations with extensive details of the building can be observed to measure its feasibility. A typical 3D architectural model comprises images and documents that help an architect concoct about its requirements in terms of materials, thereby estimating an approximate cost of the building. 3D visualization also helps to find potential flaws and loopholes in the building well in advance before its construction, thereby helping save funds, time, and most importantly human lives. China is the largest economy whose major economic activity is based on manufacturing. Large-scale construction and infrastructure activities are key to the rising adoption of 3D mapping and modeling. Japan is one of the leading manufacturing countries in the world. It is adopting advanced technologies such as robotics and 3D printing to improve productivity and efficiency. Australia and New Zealand are key countries in this region with developed economies. They have large industrial groups related to mining and manufacturing. Some of the emerging economies in APAC are also adopting 3D mapping and modeling technologies on a large scale which is evident from the fact that one of the leading universities in Malaysia developed a 3D software model to enable utility, telecommunications, and pipeline companies to accurately retrieve information, such as pipeline depth, intersection, and distances. Major vendors in the 3D mapping and modeling market include Vricon (US), Airbus (Netherlands), Autodesk (US), Bentley Systems (US), Alphabet (US), Trimble (US), Intermap Technologies (US), Esri (US), CyberCity 3D (US), Topcon (Japan), Dassault Systèmes (France), Adobe (US), Pix4D (Switzerland), Pixologics (US), Flight Evolved (US), MAXON (Germany), Onionlab (Spain), The Foundry Visionmongers (UK), Mitsubishi Electric (Japan), and Apple (US). In December 2018, Autodesk acquired PlanGrid and developed complementary construction software. Autodesk’s BIM 360 construction management platform connects the people, data, and workflows on construction projects. In November 2018, Vricon partnered with a major US telecommunications company, to accelerate 5G rollouts across the US. The company will use Vricon’s high-resolution 3D geodata to support large-scale 5G telecommunications network planning and design. In June 2018, Bentley Systems acquired Synchro Software, headquartered in London, leader (and the market creator) in 4D construction modeling software, for scheduling and project management. In February 2018, Trimble launched new mobile mapping solution name “Trimble MX9”. The application is specially designed for transportation infrastructure planning, as-built surveying, GIS mapping, and asset management. In January 2018, Google released a new version of the desktop version of Google Earth Pro version 7.3.1. This new version 7.3.1 represents some significant work by Google to add bug fixes, performance and feature improvements, and security upgrades. Where will all these developments take the industry in the mid- to long-term? What are the upcoming industry applications for the 3D mapping and modeling market? Which are the major factors expected to drive the 3D mapping and modeling market in the near future? Which region would offer a higher growth for the vendors in the 3D mapping and modeling market? Which application area would account for the highest market share in the 3D mapping and modeling market? * Business Overview, Products/Solutions Offered, Recent Developments, SWOT Analysis, and MnM View Might Not Be Captured in Case of Unlisted Companies. The study involved 4 major steps that helped estimate the current market size of the 3D mapping and modeling market. Exhaustive secondary research was done to collect information about the parent market and peer markets. The next step was to validate these findings, assumptions, and sizing with industry experts across the value chain through primary research. Both top-down and bottom-up approaches were employed for estimating the complete market size. Thereafter, market breakdown and data triangulation methods were used for estimating the market size of segments and subsegments. In the secondary research process, various secondary sources such as Hoovers, Bloomberg BusinessWeek, and Dun and Bradstreet have been referred to for identifying and collecting information for this study. These secondary sources included annual reports; press releases and investor presentations of companies; white papers; technology journals and certified publications; and articles from recognized authors, directories, and databases. The key players in the industry and market have been identified through extensive secondary research. The 3D mapping and modeling market’s expenditure across regions and its geographic split in various segments have been considered to arrive at the overall market size. All percentage shares, splits, and breakups have been determined using secondary sources and verified through primary sources. After arriving at the overall market size using the market size estimation processes as explained above the market was split into several segments and subsegments. To complete the overall market engineering process and arrive at the exact statistics of each market segment and subsegment, data triangulation methods, and market breakup procedures were employed, wherever applicable. The data was triangulated by studying various factors and trends from both the demand- and supply-sides in manufacturing industries. Autodesk (US), Bentley Systems (US), Alphabet (US), Trimble (US), Intermap Technologies (US), and Esri (US). A total of 20 players covered. This research report categorizes the 3D mapping and modeling market based on components, applications, industries, and regions.